This book is a collection of lectures given by Maxine Greene over a period of twenty-five years. Greene, who passed away in 2014, was an outstanding example of the integration of scholarship and the arts, aesthetic education and social thought. As such, this book is for all those who are interested in education and who seek to make their classrooms energetic, immediate, and alive with imagination and critique (vii-viii). It is a book for any educator in any discipline who seeks to embody transformative classroom experiences for their students. 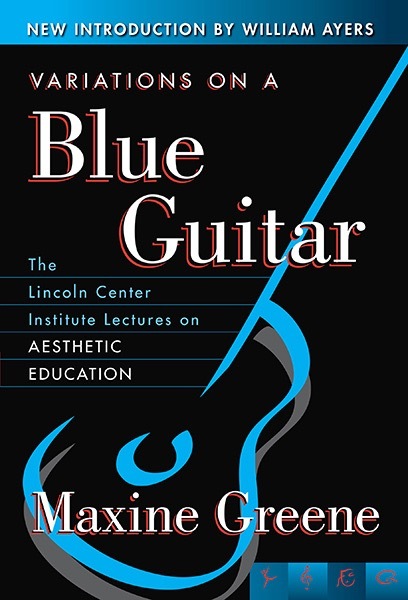 Variations on a Blue Guitar’s introduction and preliminary material familiarizes readers with Greene’s work and her role in the Lincoln Center Institute for the Arts in Education at Columbia University. The book is divided into five sections. The first introduces the reader to aesthetic education. 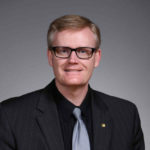 Greene believes that aesthetic education creates different modalities of expression that result in new ways of doing education in the classroom. 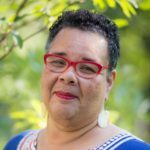 For Greene, engaging art in education elicits “fresh connections, unsuspected meanings, and. . . continuing discovery” (42). The second section works through the experience of the imagination and its implications in the classroom. One of the goals of education using art is to suggest alternative realities for the material being discussed. Greene describes concrete, purposeful, and evocative experiences with art. However, she also gives concrete examples of how one can live these experiences in moments of awareness in the natural world (72). Furthermore, she uses examples from literature, visual art, and even the natural world of these moments of awareness where an awakening occurs and one has a new field of perception of reality. The third section of the book moves from these experiences to the concrete classroom. Greene advocates for including art in active learning, critical questioning, narrative, meaning-making, authentic assessment, collaboration, and community (146). She champions the arts in a world that is increasingly technological and dependent on the internet and computers; some experiences can only be rendered through the arts (172). This emphasis on the arts does not ignore excellence and standards. In fact, art improves classroom standards that appeal to traditional banking models of education. In the fourth section of this book, Greene describes how minorities are a rich source of creativity and thinking outside the box. Education should strive not to rule others and furthermore it should not classify minorities or put them in hierarchies to silence them (198). Greene’s endeavor to give dignity to often silenced voices is a strength of this book. She states, “[T]he cruelest thing we can do. . . is to categorize young people. . . whether we call it ‘Asian,’ ‘Hispanic,’ ‘African American’” (152). Overall, this book is beneficial as Greene pushes the reader beyond conventional means of education. It is a helpful resource for teachers in all fields of the discipline as they discover new dimensions of themselves and their pedagogy.